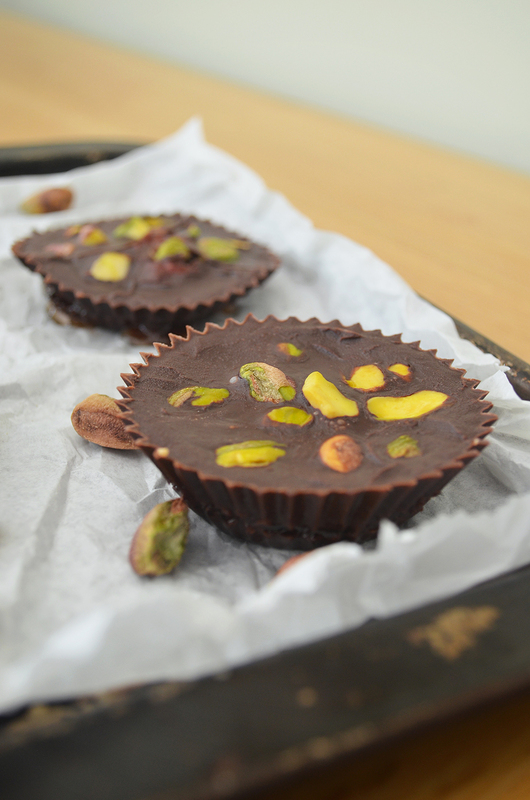 You can make chocolate using only coconut oil, cocoa powder and a liquid sweetener of your choice. Yup. I have to give all the thanks to JessBeautician (and her delicious looking DIY orange chocolate) for this one. PMS has been changed forever. So of course, with a jar of cashew butter kicking around, begging to be eaten, and some new found chocolate making knowledge, there was only one logical way to proceed. 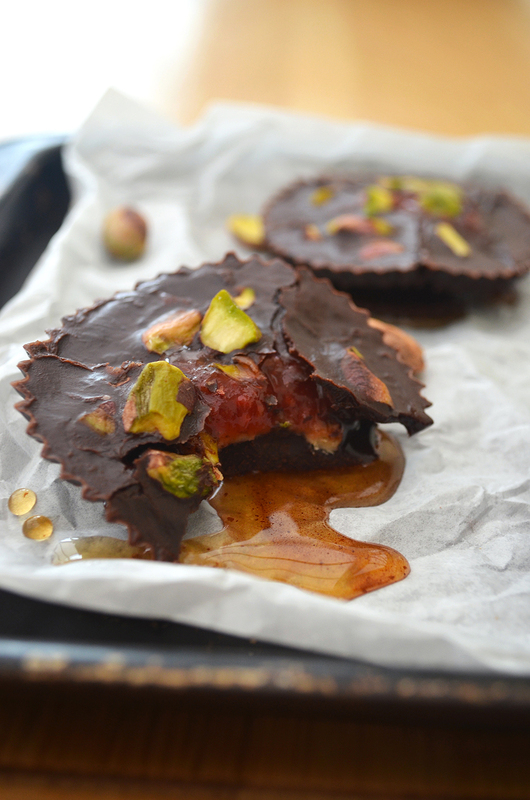 Cashew butter cups. 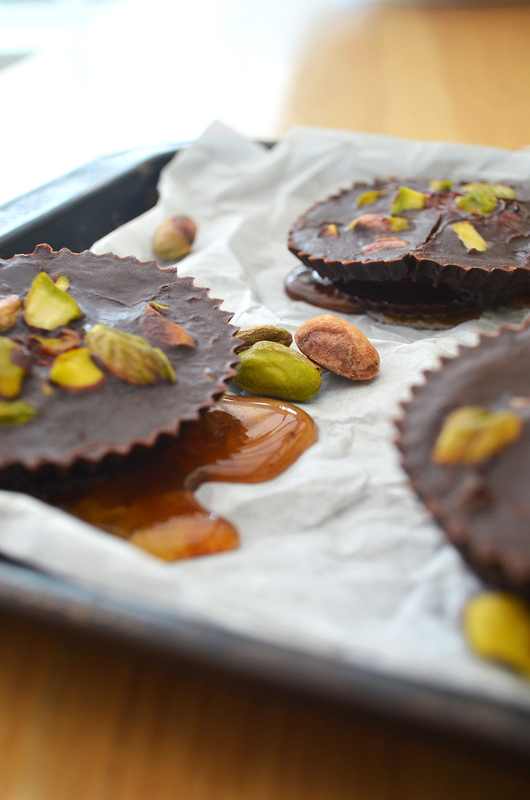 Sweet, sweet cashew butter cups. And because I have a habit of always wanting to throw in more ingredients than are ever necessary, I also added a blob of my favourite raspberry rhubarb jam I got from Markthalle Neun in Berlin, for a play on a PBJ and a Reese’s Butter Cup. 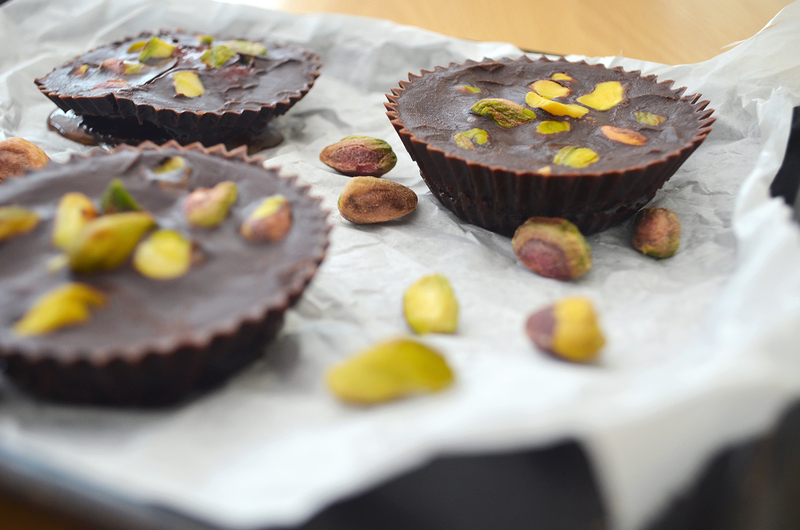 And then I topped them all with pistachios, for some crunch, and because everything is better with pistachios on top. I’m pretty pleased with how they turned out actually! Although as you can probably see from some of the photos, there was a little jam oozage – is that a word? 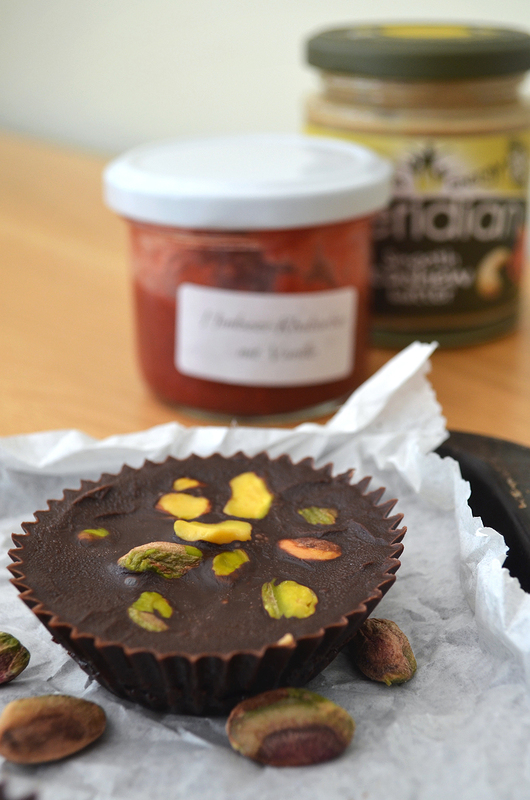 I’m making it one – so I would recommend using quite a firm jam if you want a cashew butter cup that doesn’t make a mess of your chin/and or your clothes. Or just wear a bib. I promise what they lack in elegance, they make up for in taste. These have to be stored in the fridge as they’re oil based, but they have a lovely smooth, melting chocolate texture when you eat them. Honestly, I wish I made a bigger batch, but for the sake of my waistline it’s probably good I didn’t. Besides, I’m already plotting my next chocolate cup creation. This DIY chocolate business is dangerous. A delicious twist on the classic peanut butter cup and a PBJ, all cloaked in simple homemade chocolate. Makes 6 cups. Place 6 cupcake liners onto a plate or a tray to ensure they're easy to move back and forth from the fridge. Melt the coconut oil in the microwave for 15-30 seconds until it's completely liquid. Whisk in the cocoa until smooth, then add the agave nectar. Pour just enough of the chocolate mixture to cover the bottom of each cupcake liner, then place into the fridge for 15 minutes to set. Once they have hardened, dab a small amount of cashew butter, then jam into the middle of each cupcake liner, then top with the remaining chocolate mixture, then place back in the fridge for 5 minutes. Add the chopped pistachios, then place back into the refrigerator until hardened. They should be ready to eat after about an hour. If your chocolate mixture starts to harden again, place it back into the microwave for 10-15 seconds. Yes! This sounds delightful. Such a creative idea! These look so impressive, and so tasty! I love Reese’s Peanut Butter Cups but these are like Reese’s fancier older brother. Haha love that description, that’s how I’ll be describing them from now on!